To organize a cover reveal or not? How to go about it? Alone? With a provider? How about tying it to a pre-order? How about a giveaway? There are a lot of questions to ask oneself before organizing anything, especially when it taps into your self-publishing funds. I usually set up my goals ahead of time now and try to stick to them. To gather interest, to create a possible buzz around the book…and to share more about your book with the world. In addition, if you have a pre-order set up, that could be the moment to mention it. How about a giveaway with the cover reveal? It all depends. What are your goals? What is your budget? For A Summer Like No Other, I decided to have a giveaway along with the cover reveal. Another way to spread the word about my book. Cover reveal: how to set it up? There are so many ways to set it up: either yourself if you have enough following. Or with a provider. Usually setting it up at least a month in advance really helps to gain traction. When it comes to providers (including prices), there’s a good list here. As mentioned I’ve used Xpresso Book Tours and it worked very well. You can also organize an exclusive cover reveal with a blogger or a particular website. I’ve never done that one so not sure how it works, or the results. What did I want to achieve with the cover reveal? I wanted to put my books in front of bloggers and possible readers, to create a buzz, to gain new Facebook group members and newsletter subscribers. Possibly new Instagram followers & Twitter followers too. And I also thought maybe some would pre-order my book. Definitely worked. And yes, I know, many new members are mainly here for the giveaway buuuuuut some are not and I’ve interacted with some already and I’m really enjoying that. I think that worked. I’m getting a few comments that readers keep on hearing about it and on Netgalley, 5% have clicked that they liked the buzz when requesting. I wish I could compare those numbers with One, Two, Three but I don’t have those. Hmmm. This is where I have to remind myself this is a marathon not a sprint 😛 I have 11 pre-orders for A Summer Like No Other on Amazon. But crossing my fingers that just means everyone is waiting for release day. Right? Right. Most probably, yes. It depends when I finalize the cover and blurb of Always Second Best. I’d like to do the sign-ups for the cover reveal much earlier, giving at least a month for people to sign up. And then do the giveaway right when the book goes up on Netgalley (like I did this time around). Basically, I need to work on the detailed timeline to see if it works or not. How to put up your book on Netgalley as a selfpub author? There are different options for selfpub authors. You can book a spot for different lengths where someone else is handling everything for you. I used Patchwork Press in the past and loved working with them. And I know that Xpresso Book Tours is also offering this service now. You can also try to find a co-op where you can put as many books as you want within a year (one at a time) and where you need to handle some of the requesting and so on… I love being in a co-op. I love being able to switch my books easily and to know that I have a spot for each of them without having to worry. I think the co-op works best when you have a lot of books coming out in one year. And if you like being hands-on on certain aspects. You can also “rent” your spot when you’re not using it. It’s always relative, isn’t it? 🙂 I think that having a book on Netgalley really helps to get your book in front of thousands of readers/reviewers. For a month, $60 seems to be the price on both Patchwork Press & Xpresso Book Tours. The co-op is for a year and I pay $350 I think the co-op works well for me, because I already had two books up and I have 5 more planned before May next year. And it gives me quite a bit flexibility, when it comes to adding things to each book’s profile. For example, I now have files in the press kit section. Among other things. What did I want to achieve with Netgalley? I had lots of requests. LOTS of request. At least it felt like it 🙂 The first time around, I had 310 requests for review The second time, I had 193 requests for review. Overall, on Goodreads I had about 65 reviews from Netgalley and on Amazon, I think more than half of my reviews are from Netgalley members. What happened after the book was no longer on Netgalley? 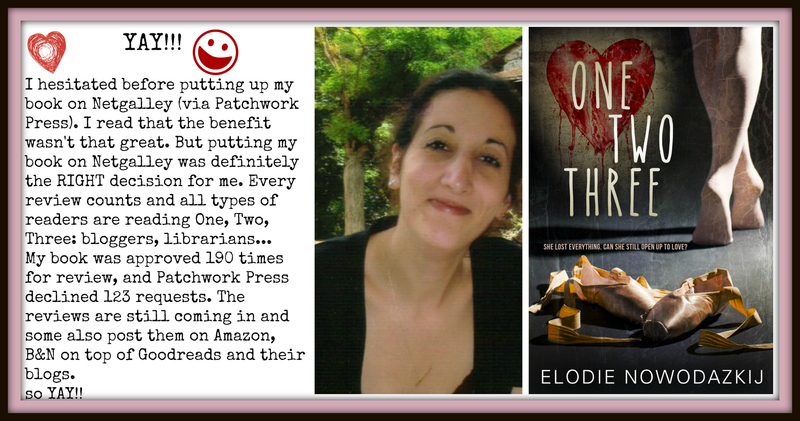 I am still getting reviews for One, Two, Three, and I am so happy it enabled me to connect with readers and reviewers. Freebooksy promotes free books (being perma-free or those free for a limited period of time). At the time of this post, they do not restrict their ads to full-length novels. I checked with them to make sure I could buy an ad for a novelette and it was fine. Freebooksy currently advertises to more than 130k newsletter subscribers and 200k+ Facebook fans. What did I want to achieve with a Freebooksy ad? 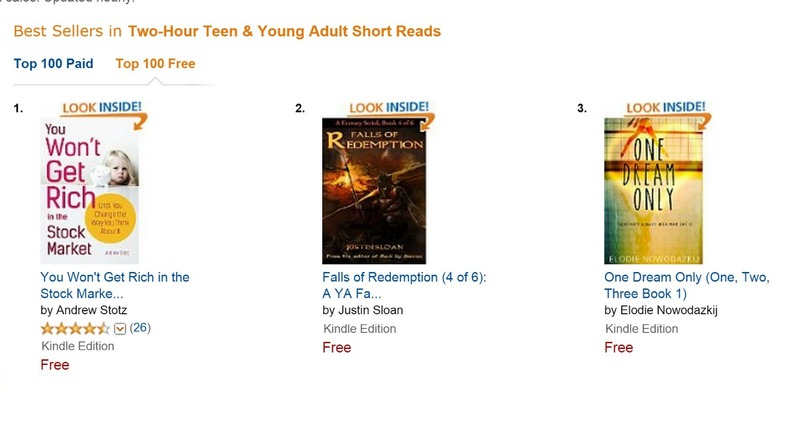 More than 700 copies on the day of the ad and overall more than 1000 copies….During the ad, One Dream Only ranked #3 in the free Best Sellers in Two-Hour Teen & Young Adult Short Reads. What happened after the ad? – I gained two new members in my Facebook group. Yes. In my view, it was. Gaining new readers is so important. Plus, I love connecting with them, so I am very excited whenever they either subscribe to my newsletter or join my FB group. In addition, when people download something free, they may not read it right away and I think I’m still seeing some One Two Three sales thanks to the ad. Yes. But not right now. Right now, I’m going to look into ENT and BargainBooksy and others to plan some ads on ONE TWO THREE, around the release date of A SUMMER LIKE NO OTHER. #Selfpub corner – Netgalley, yay or nay? Topic of the week: Netgalley, yay or nay? Every month, I will be asking a YAY or NAY question to selfpub authors. 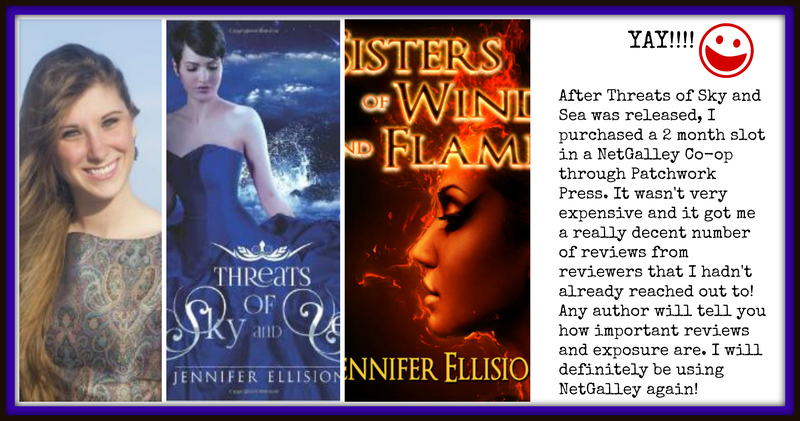 Today, Elizabeth Briggs, author of MORE THAN MUSIC and Jennifer Ellision, author of THREATS OF SKY AND SEA as well as SISTERS OF WIND AND FLAME agreed to play along. We are looking at Netgalley and our own experience with it. I will be explaining the different ways of gathering reviews as well as the different ways to get your book listed on Netgalley next week. Thanks again Liz and Jen! 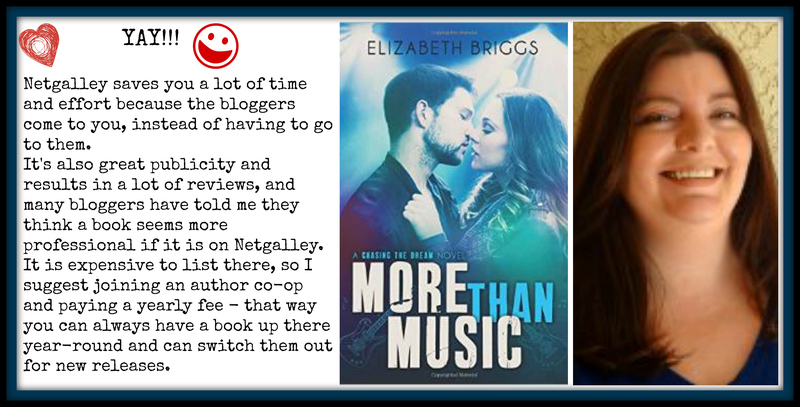 Next week’s topic: Netgalley, blog tours, Goodreads: how does one gather reviews? Covers are important, they really are. 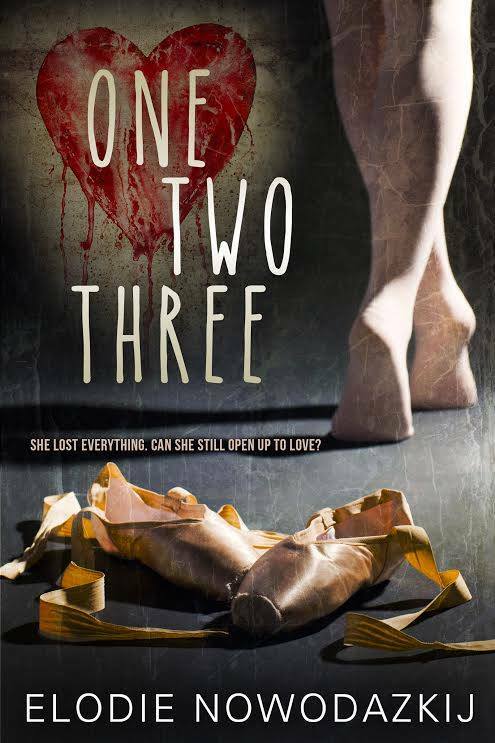 But just to show you how important the cover of One, Two, Three has been important in getting the word out, here are a few quotes from reviewers. “I totally went off the cover,” A flurry of ponderings. As you can tell, I am super happy with my cover designer: Derek Murphy from Creativindie who created magic! As a self-published author, you have many choices: you can buy a pre-made cover (which I will talk about with other selfpub authors in a future post), you can go with several types of cover designer–including ones that may even arrange their own photo shoot. The prices will definitely differ depending on what you choose. Pre-made covers are usually cheaper (you can find some on sale for $15), the ones where a photo-shoot is organized will be more costly. And then you need to decide, what type of adds-on do you want? Some cover designer will also do promotional items, others may offer discounts for future works. How did my process work? Once I contacted Derek to see if he would have some time. He sent me a few sites to look at pictures that would fit with my story, so he could get a sense of where I was going. He then sent me 9 different proposals of covers…and I showed them to my street team, who also fell in love with the same one I did: a slightly different version than the cover I have today. Based on that, he reworked it with different fonts and different placings. I chose this one because I felt the rhythm going through the cover. 1. The emotions. Oh, the emotions. Working on the cover is VERY exciting, like everything else in the process. Do you see the dancer walking away on the cover? well, it has been used by other books, and I saw it only close to publication. Cue, freaking out. Like, writing on my Facebook Team 123 secret group and the wonderful ladies there held my hand and reminded me how different the covers were, despite their one similar element. Still. This is a reality that one needs to realize, some elements of your cover may not be entirely unique. However, with a strong designer, your cover itself will be unique. And I am still in love with mine, like the very first time I saw it. 2. Choosing the cover designer. Personally, I googled cover designers for selfpub authors and I asked my dear friends Juliana and Jen to see who they were using. I also looked at the copyrights information of the selfpub books I really liked the cover of. Before contacting the different cover designers, I first had to decide which format I wanted. And of course, I had to know approximately when I wanted to do the cover reveal and when publication date was going to be, giving a bit of buffer. Always helpful to intrigue people. Of course, you also need an author photo for the full cover. Here you have to decide what type of author photo you want, but more generally speaking, the advice I received was: a photo where people can really see your smiling face 😉 This will be the topic of another post. 7. Will I do anything differently for my second book? Yes. In the sense, that my second book will only be an e-book (it’s a novelette), so I am not going for the full range of ads-on that I did for my first book. Huffington Post – Self-Publishing on a Shoestring: Cover Me, Baby! SelfPublishedAuhor – 8 mistakes that will absolutely kill your book! I have been thinking for the past few weeks how to best share my experience int he self-publishing world. I have had people reaching out to me and asking me questions. I always try my best to answer and I thought maybe others would also benefit from my experiences: what I learned, what I would do differently and what I will do again for my second release. 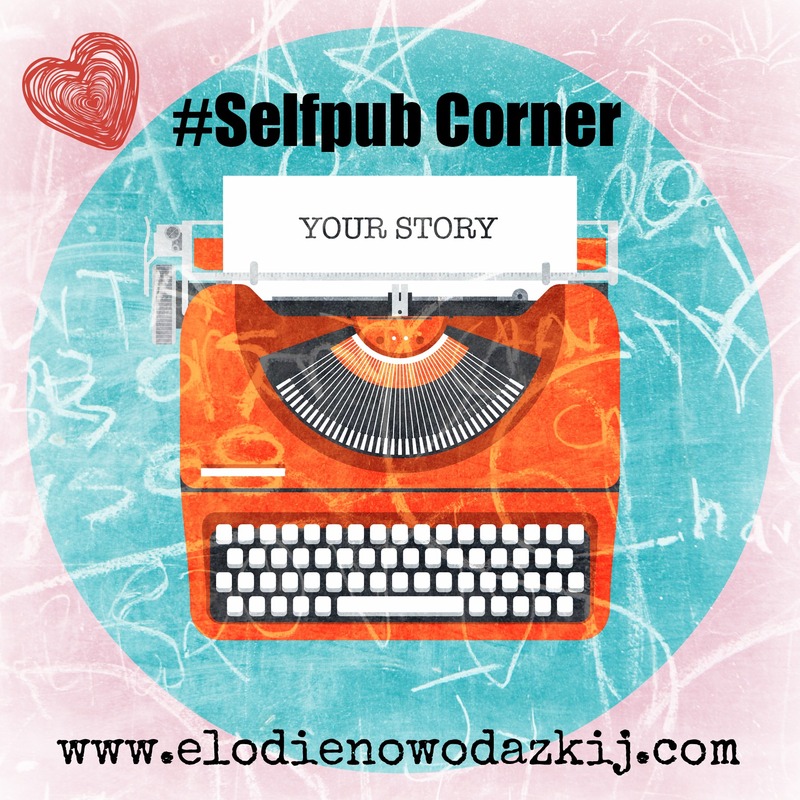 So…I will be starting as of next Friday the #Selfpub Corner. Isn’t a cute button? I love it. I always admired the ones Jaime created and she told me about PicMonkey. Love it! Every week or so I will take a different question or angle, such as: how to get reviews, why use Netgalley (if at all), how did I find my editors, my cover designer, and then from times to times I will feature a self-published author asking a few questions or asking them to share their own experience. Are you a self-published author and would you like to get featured on this new corner of my blog? Do you have any questions you want me to answer about my experience? Leave me a comment or don’t hesitate to shoot me an email.